Peter Bryer: Mobile Foresight: Welcome to the jungle. An Amazon phone can be expected to "pack a lot of sophisticated hardware into a very low price point." Welcome to the jungle. An Amazon phone can be expected to "pack a lot of sophisticated hardware into a very low price point." Will 2013 be a very unlucky number for many incumbent smartphone vendors? Will Amazon become the piranha of the industry, ripping away profitability flesh? It's most tempting to look for your greatest competitive threats coming directly from existing competitors. But that's like looking for your lost keys under the lamp because that's where the light is. So, rumors of an Amazon smartphone are getting loader and more serious. According to some sites including several in Taiwan, Foxconn has leaked info about an Amazon smartphone coming mid-2013. Such a device would likely run an Amazon-spiced version of Android, but no real solid spec details were included. The price of such a device —perhaps as a cliché it will be called the Kindle Phone— is reported to be between $100 and $200. Such a price is not at all unprecedented for a subsidized smartphone, but if Amazon sells such a device with no strings attached at around the cost of materials, it could require handset makers to re-examine their existing business models. There are certainly no guarantee of success for Amazon. Google has not set the world on fire with their own Nexus line of smartphones. And there are many unanswered questions concerning service providers and geographical markets. It could be that '13 really does turn out to be an unlucky year for some smartphone vendors —as long as we make it past tomorrow (December 21, 2012) that is. 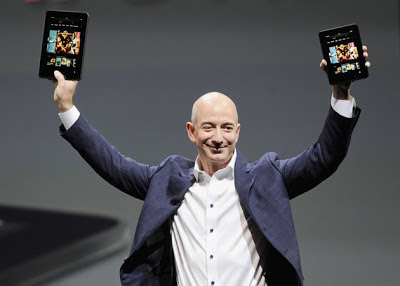 Amazon's Jeff Bezos on the Kindle: "Our approach is to work hard to charge less. Sell devices near breakeven and you can pack a lot of sophisticated hardware into a very low price point."